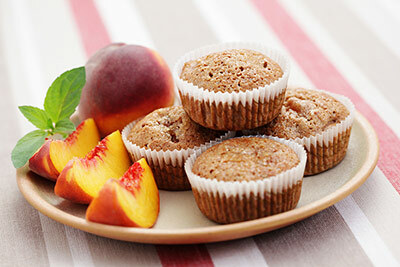 Spray muffin pans with nonstick cooking spray or line with paper baking cups (2 1/2 inch; 12 count). In a large bowl, mix flour, brown sugar and baking powder. Add peaches, baking soda and allspice. Toss to coat peaches thoroughly. In another bowl, combine sour cream, egg and butter. Add to dry ingredients and stir just until moist, batter will be lumpy. Spoon evenly into prepared muffin pans. Bake for 20 to 25 minutes, or until the top springs back when gently touched.